Genexis offers development and consulting services for creating and managing smart cards and contactless cards applications. What is the difference between contact and contactless smart cards? The main difference between the two methods is in the way how data is transferred from card to the reader. For contact cards, the contact (or chip) on the card must physically touch the matching contacts in a card slot on the reader. In the contactless card, the card only needs to be near the reader as the transmission of data is through radio frequency. What Contactless card systems do you use? We use Advanced Card System's ACR122U readers/writer in our contactless cards applications. Please inquire if you have require assistance in developming contactless cards and smart cards applications. 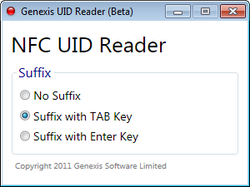 Genexis NFC UID Reader is a small ClickOnce utility that reads NFC contactless tags and outputs its unqiue ID (UID) as keyboards inputs in any active application. The purpose of this tool is to simulate the same behaviour when you scan a barcode using a barcode scanner. You can use this tool to read NFC loyalty cards in replacement to barcode-based loyalty cards. Currently this tool supports ACS's ACR122U & ACR122T NFC card reader.